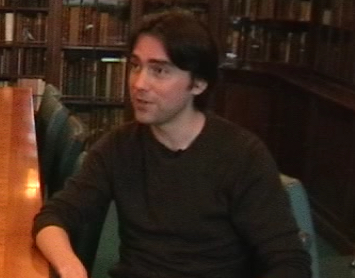 Dr Tim Lewens is a Lecturer in the Department of History and Philosophy of Science at the University of Cambridge. He is the author of Organisms and artifacts (2004), which examines the language and arguments for design in biology and philosophy, and of Darwin (2007), which considers the role of Darwin and Darwinism in modern philosophy. In this interview, Dr Lewens discusses the role of Darwin in modern science, the arguments for intelligent design in nature, the implications of evolution for religious belief, and the importance of a historical understanding of Darwin’s work. This is part of a series of interviews that the Darwin Correspondence Project at the University of Cambridge is holding with leading scientists and scholars in a wide range of fields, and our aim is to discuss the importance of Darwin, historically and today, and to focus on some of the conversations that he had with his correspondents about the nature of religious belief and the moral and theological implications of evolution. We’re joined today by Tim Lewens. Tim is a philosopher of biology. He teaches in the Department of History and Philosophy of Science at Cambridge, and he’s written two books that are directly relevant to our concerns: Organisms and artifacts , which examines the language and arguments for design in biology, and -just out – a wonderful book on Darwin and philosophy. Thanks very much,Tim. Well, thank you for the flattering introduction. In your most recent book, you remark on the extremely unusual role Darwin plays today. Darwin’s works, though written a hundred and fifty years ago, continue to be read, not just by historians of science but by modern scientists. Why do you think this is the case? It’s a good question. Part of the reason, I think, is just that the works, by and large, are extraordinarily accessible. Or at least, the ones that we know best now, one of the things they probably have in common is precisely their accessibility. The origin of species is an extremely easy read, certainly by the standards of most scientific books; the same’s true of The descent of man ; the same’s true of The expression of the emotions in man and animals . The books which aren’t read so much these days are probably the books which, frankly, are a bit of a harder read. So, Darwin’s study of variation, for example, in plants and animals [ The variation of animals and plants under domestication ], is, I guess, not one that’s widely read. So, part of the reason is the accessibility of the books. Another reason, I suppose, is basically the thought that, basically, Darwin got it right: in some sense or another, Darwin’s view of evolution is, at least many scientists think, basically the same view we have now. And I think, again, in broad terms, that’s about right, although I have a few little adjustments I’d like to make. And another reason is that Darwin puzzles over so many of the conceptual issues that face modern evolutionary biologists now: issues about progress, issues about ethics, issues about morality, the mind, knowledge, and so forth. So, he’s a repository for debate about debates that we have right now. Let me just take this one step further. Modern scientists not only read his work, but some identify with him to an exceptional degree, to the point of calling themselves Darwinians or proponents of Darwinism . We don’t find this strong identification of a particular theory with a person anywhere else in science. Do you think this has something to do with how Darwin’s reputation was forged in the 19th century: the ways in which both his name and work were linked to the progress of knowledge? I think it’s aninteresting question about why it is that people call themselves Darwinians now. One thing I’ve remarked on in the book is that you don’t find this kind of analagous phrase Einsteinians bandied around, even though, certainly, Einstein is as important for physics, I would say, as Darwin is for biology. There’s a perception which I think probably started towards the end of the 19th century but which has in some ways taken over again at perhaps an even stronger level than before, and that’s the idea that Darwinism is a theory that has massive implications for all kinds of different areas: areas that range, as I’ve said, from not just the origin of plant species and animal species but issues about the nature of morality, issues about God, issues that go to the very heart of what people have tended to think of as deep philosophical questions. And so, if you think that Darwin’s basic views really do have implications in such a broad array of areas then it’s hardly surprising, I think, that some people are going to want to call themselves Darwinians: they’re going to want to make a philosophical ism – a philosophical position – out of this view, in a way that may not happen for other influential scientists whose views, to be sure, are very important for physics but maybe don’t have that kind of all-encompassing aspect that, as I say, some people have viewed as certainly inherent in Darwin’s work. So this has something to do with the current status of biology, which has expanded into the other domains, like psychology, like even religion, and also the kinds of claims and promises that are often made with regard to genetics, so that Darwinism, for some, has become a kind of total world view: a vision of how the future ought to be and, for some, a weapon in a battle that’s ongoing? I think that’s right. One other thing I’d add to that, if I can, is: what’s usually stripped out from Darwin’s own work now as in some ways being the most important idea, is the idea of natural selection. One of the things that many people claim for the idea of natural selection is that it’s a very simple idea, and a very simple idea with extremely general application. And many people think that natural selection is nothing more than differential survival of one kind of thing over another kind of thing. If you characterise natural selection in such a general way, then people begin to apply it to all kinds of areas. They don’t just apply it to plants and animals, they apply it to changing ideas; they apply it to changing neural patterns; they apply it in economics’; they apply it all over the place – and that’s another reason, I think, why Darwinism has been viewed to have such an enormous significance and why, for some people, it is a kind of world view. It’s because what, for many people these days, is certainly the essence of Darwinism, is also an extremely simple and extremely abstract idea which in turn allows it to be applied and reapplied in slightly different ways in all kinds of domains: not just, even, within biology. 5. Does historical accuracy about Darwin matter? Part of what we’re seeing today is a struggle over Darwin’s name and legacy. You’re careful, in your book, to distinguish between Darwin and Darwinism: between what Darwin himself wrote and what others have claimed in his name. Given how much has changed in the natural sciences - and in biology in particular – why should the historical Darwin matter at all? Well, in a funny way, I think your preamble to that question contains the answer within it. I mean, the very fact that Darwin himself is used today by prominent biologists, the very fact that there are disputes over what the real nature of Darwinism is, and the fact that Darwin is always invoked to try to boost one kind of reading of a good Darwinism compared with a bad Darwinism, partly shows the importance of looking at what Darwin himself really said. You need to look at whether or not these invocations of Darwin for one side or another really are legitimate. And I think you might add to that that as well as simply seeing whether or not the invocations of Darwin which real biologists these days make quite regularly are historically accurate. There are also, I think, some interesting things to learn about how one might go about constructing a view of the world – a general view of life; a general philosophy – by looking at Darwin’s own claims more directly, as well.